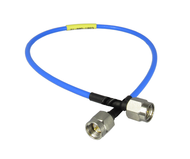 These SMA cable assemblies are available in versions from 3-27ghz. Our sma cables use stainless steel connectors above 6ghz; sma cable assemblies rated at 3 or 6 ghz use either stainless steel or brass connectors, please see individual data sheets. All of these sma cable assemblies are flexible. Our sma to sma cables can be used in placed of adapters. We have sma cable assemblies rated from 3 to 27Ghz. Please select from the drop down menu above to find the exact sma cable that will fit your needs.